Archion Technologies is a global leader in intelligent, high performance shared storage solutions for media workflows, with an emphasis on 4K video storage specifically designed for the editorial, graphics, and other media workflows commonly used where creative storage systems are required for the broadcast, production, corporate, education, government, house of worship, and sports industries. 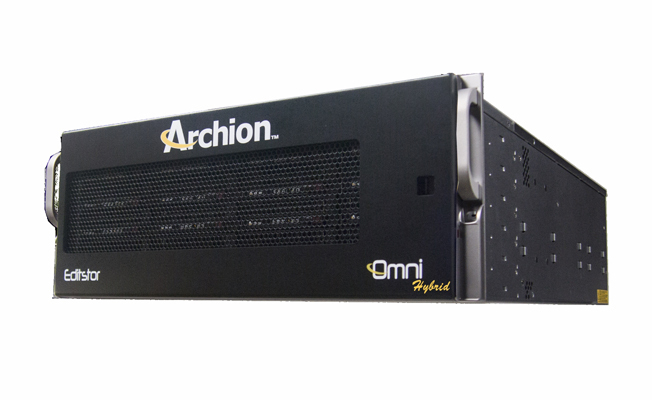 Archion Technologies, a leader in intelligent, ultra high performance shared storage solutions for media workflows, has announced that its award winning EditStor media storage product line, comprised of the EditStor EO, EditStor Velo, EditStor Omni and Omni Hybrid, now feature additional performance, capacity and functionality enhancements. To further improve the EditStor’s performance, Archion has doubled the RAM across the product line for faster GUI and system performance. The system now supports advanced protocols, such as "SMB3" and "NFS4". Already one of the most scalable high performance tier 1 media storage solutions, EditStor can now expand to 2.4 Petabytes with the addition of up to 10TB drives. In 2016, Archion strenuously tested and ultimately certified both 8TB and 10TB Helium drives. These high capacity Helium hard drives support the same high speed and throughput - the Helium platform delivers the very best capacity hard drive in the industry, the Ultrastar He10. The He10 uses PMR technology and is the industry’s first 10TB drive that is drop-in ready for any enterprise-capacity application or environment.